Apple may have just unleashed a salvo of products with the iPhone 6 and iPhone 6 Plus, but the Cupertino company isn't done yet. The Daily Dot reports Apple is planning to hold an event on October 21 to introduce two new iPads and announce the release date of OS X Yosemite. The two tablets will likely be the new iPad Air 2 and the iPad Mini 3. Recently the rumor mill has already been spinning up with early reports claiming the iPad Air 2 will be even thinner than last year's model. This morning we just spotted a new case for the Apple's next slate, which featured a new mystery hole located near the iPad's rear camera and lock button. There's still a lot of mystery surrounding this addition and a few theories posit it has something to do with an improved camera. 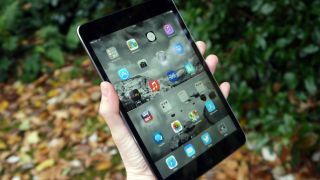 Aside from some cosmetic changes, we expect the iPad Air 2 will come rocking Apple's latest A8 processor. The tablet could also adopt NFC technology and be the company's first tablet with a TouchID fingerprint scanner. Together these new features would allow users to pay for goods and services using Apple Pay with their iPad. Of course the other big-ticket item we're still waiting to see from Apple is Yosemite. The next Mac operating system was predictably left out of Apple's iPhone event to give iOS 8 the run of the show. However, at the iPad unveiling we could finally get a release date for the OS and see its finalized features. Apple first unveiled OS X Yosemite and its iOS 7-inspired flat UI at WWDC 2014. On top of the graphical overhaul, Yosemite will introduce a new handoff feature, which allows users to seamlessly transfer everything from calls to documents between their desktop and mobile device.